Maybe you were wondering why my blog posts have been so rare lately? As my sister pointed out to me, my silence is directly related to my recent acquisition - my new favorite thing: a Wii. I am not actually sure that I can adequately express my love for it. The first day I broke it out of its box, I simply played the sports games that came with it. Fun! 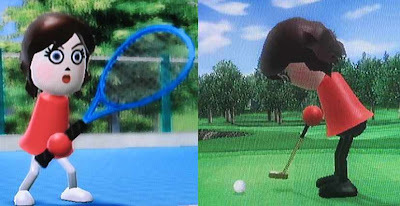 Then, I broke out the Wii Fit Balance Board that I bought with it, and me and my Mii have been spending a lot of quality time together. To date, my Mii is 2.7 lbs lighter than nearly 2 weeks ago! YAH-Mii! I have never been an athlete, but when I have that controller and Nunchuk in my hand, I feel like Serena Williams, Anikka Sorenstam and Rocky, all rolled into one!! The virtual world is a happy place!! Just look how cute I am in those candy-striped baseball tights!! !